Story by Matt Gregoire #28647, Joe Feidt #362, and Jim Palmeri #23. Photo of “Steady” Ed Headrick #001 courtesy of the Disc Golf Association. Photo of Simon Lizotte #8332 courtesy of LEL Photography. “Steady” Ed Headrick #001 is considered the Father of Disc Golf. Of his dozens of patented inventions, two of them hold infinite importance to our sport. The first was the Frisbee (U.S. Patent #3359678) in 1966 as an employee at Wham-O. 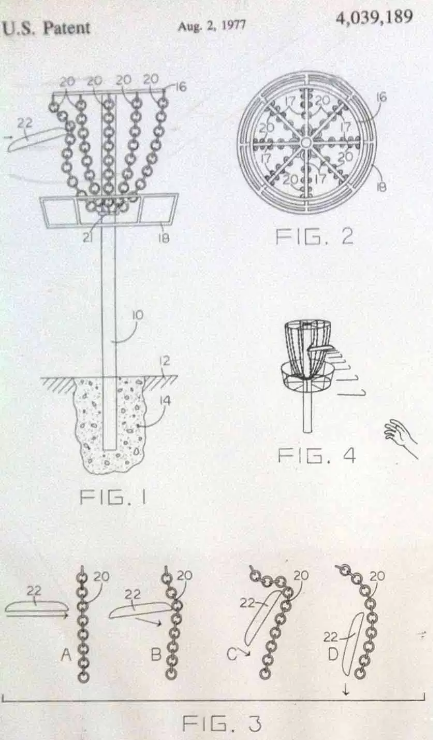 The second was the basis of all disc golf targets today, the Disc Golf Pole Hole (U.S. Patent #4039189) in 1975. Disc Golf Pole Hole Patent image courtesy of the Disc Golf Association. In 1965, George Sappenfield #376 was a recreation counselor during summer break from college. While playing golf one afternoon, he realized that the kids on his playground could play the golf game with Frisbee discs. He remembered his idea when in 1968 he finished college and became the Parks and Recreation Supervisor for Thousand Oaks, California. George contacted the Wham-O Manufacturing Company (at the time, Wham-O was THE disc company) about his idea and asked if they could help out with his plan to hold a Frisbee golf contest for his recreation program. Wham-O sent Frisbees and Hula Hoops to use as the targets. The next year, George talked "Steady" Ed Headrick of Wham-O into including a Frisbee golf event in the All Comers Frisbee Meet that Ed and Wham-O were planning to hold at Pasadena's Rose Bowl as a promotional event. Unfortunately, that was the last mention of Frisbee golf by Wham-O for over seven years. Even in Goldy Norton's Official Frisbee Handbook of 1972, which listed and described all the activities and events that could be played with a Frisbee, there was no description of or information about Frisbee golf throughout the book. It was almost as if the concept didn't even exist. Apparently, disc golf didn't fit into the promotional plans that Wham-O had for its Frisbee brand flying discs. But, the game of disc golf did indeed exist. Despite having never heard of the International Frisbee Association (IFA) that Ed and Wham-O had put together, or ever seeing a copy of the IFA Newsletter, Jim Palmeri, his brother, and a small group of people from Rochester, NY, had been playing disc golf as a competitive sport on a regular basis since August of 1970, including tournaments and weekly league play. By 1973, they had even promoted two City of Rochester Disc Frisbee Championship events which featured disc golf as the main event. In 1973, this avid group of disc golfers first happened upon a copy of the IFA newsletter. They were amazed to hear of the Frisbee culture that existed well beyond their little sphere of activity. They decided to make the 1974 City of Rochester Disc Golf Championship a national tournament to find out just how many other people around the country were playing disc golf. They called the event the American Flying Disc Open (AFDO), and to attract the attention of the Frisbee community, they put up a brand new 1974 Datsun B210 to be awarded to the winner. 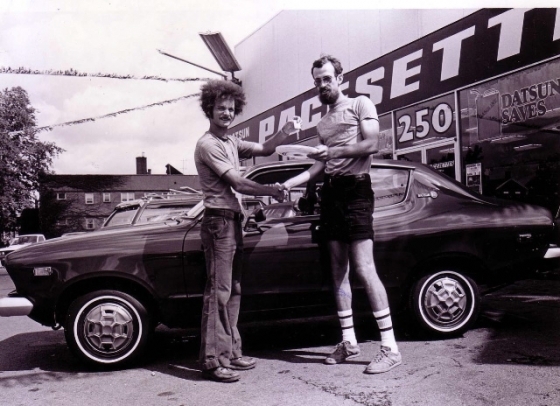 Jim Palmeri #23 (left) handing Dan "Stork" Roddick #003 (right) the keys to his prize for winning the 1974 American Flying Disc Open. The burgeoning interest in the game of disc golf that grew rapidly among Frisbee players and IFA members during the rest of 1974, and in the summer of 1975, grabbed “Steady” Ed’s attention. As an executive at Wham-O, he began to reassess the value that disc golf might hold for their business. Ed created a new Sports Promotion Department at Wham-O and hired the winner of that 1974 AFDO, Dan “Stork” Roddick, to be its director. With feedback from Stork, George Sappenfield, and the fledgling but rapidly growing disc golf community in general, Ed decided to include disc golf as an event in Wham-O’s upcoming 1975 World Frisbee Championships. In the years leading up to DGA’s founding in 1976, the sport was already moving quickly. In 1975, “Steady” Ed installed the first official disc golf course at Oak Grove Park in Pasadena, Los Angeles County, California, with the targets being nothing more than permanent poles placed into the ground for targets. Disc Golf Pole Holes would later replace the poles in the ground in 1976, causing a massive increase in disc golf traffic on the property. Due to the overwhelming success of the 1975 World Frisbee Championships, and subsequent positive reinforcement from the players, Ed became convinced that disc golf could be something big. With a growing family to feed and a mortgage to pay, Ed abruptly resigned his VP position at Wham-O and started the Disc Golf Association business in April 1976, a business that continues to be a leader in the sport to this day, now commonly referred to as simply DGA. This pivot by the man we now call the Father of Disc Golf was truly astounding in retrospect: here we see Ed giving up a secure, well-paying job at one of the top toy companies in the world to start a new company and promote a new sport that 99.9999% of America had never even heard of! That took guts and vision. 1977 World Frisbee Championships video courtesy of Barry Peters. One of Dan Roddick's first moves as director of the Sports Promotion Department at Wham-O was to incorporate disc golf as an event in the national tour of qualifying tournaments for the World Frisbee Championship event that Wham-O was continuing to sponsor on a yearly basis. This move introduced disc golf to thousands of Frisbee players around the country and in Canada as well. It also opened up big markets for Ed Headrick's DGA to sell and install courses all over the country. Ed was truly a master marketer and salesperson. He traveled all over the country promoting disc golf, selling baskets at trade shows, and designing courses (some of which are still being played today). The popularity of disc golf grew rapidly. Each new course spawned more players and more courses in nearby towns and cities. 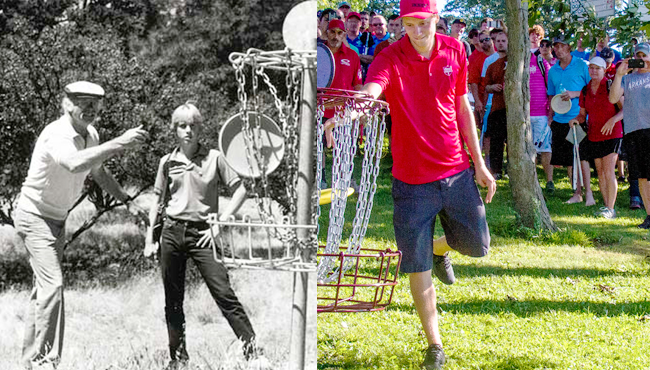 Similar to today, new players 40 years ago got bit by the disc golf bug and shared the dream of national tournaments and organized play. Soon after inventing his basket and starting his company, Ed founded the Professional Disc Golf Association. He modeled his PDGA after the International Frisbee Association that he created at Wham-O a decade earlier. In the summer of 1976 he sent out a letter to roughly 100 of the top players in the country, inviting them to join the PDGA. The cost would be $10 (about $45 in today’s money) for a lifetime membership. He then began directly selling memberships to the players at tournaments all over the country, starting with the Boulder Flying Disc Festival in July of 1976. Joe Feidt and Jim Palmeri were in Boulder for the event ready to compete, not knowing they were about to witness a great little piece of disc golf history. "That weekend I remember very clearly Ed sitting on the steps of a Colorado University campus building explaining/marketing/selling his new players' organization to a curious group of players," recalls Feidt. "He was taking cash, checks, IOUs, whatever he could for a $10 lifetime PDGA membership. Guys were writing down their names and addresses on scraps of paper and paper-clipping cash to it. I was short on cash and decided to wait to join. One of my few regrets. I joined a year later and was disappointed to get #362. Three digits looks pretty good now though!" Palmeri remembers, "Ed was pitching the PDGA for $10 a pop! I remember having very little cash flow back then, but unlike Joe, I didn’t wait. I scraped nickels, dimes, and quarters together to come up with the $10, and I was rewarded with PDGA #23!" One of the 100 original letters sent to potential PDGA members around the country. Originally sent to Lyle Jensen #102, who also provided the images. Click on the thumbnail to view it in full size.. Becoming a member in those days was a way for players to feel as if they were part of something bigger than just their local clubs. The PDGA was a players organization in which local clubs provided a feeder program of new players and money to build new courses for this new sport of disc golf. It was all brand new, and nobody—probably not even Ed—knew exactly where it was going but the PDGA generated a steady source of income and gave Ed a way to pay for mailing newsletters and other costs of running a growing organization. Another significant turning point for disc golf was an event organized by, you guessed it, “Steady” Ed in 1979. Held in Huntington Beach, California, Ed named the event the $50,000 Disc Golf Tournament, boasting its massive payout right in the title. The tournament was groundbreaking, first and foremost because of the cash involved, but also because the competitors had to qualify for an invitation. 72 qualifying events were established around the country, bringing in the best disc golfers from across the United States. DGHOF member David Greenwell #962, the one and only PDGA member that has competed in every single Disc Golf World Championships, was new to the sport at the time, but that didn’t stop him from earning an invitation. One of the oldest courses in the country was installed near his hometown, and thus began what would eventually become a legendary disc golf career. “Otter Creek went in the ground in 78’. I found out about the $50,000 Tournament early in 79’ and the first tournament that I ever played was a qualifier for it. I won the qualifier having only played disc golf for a few months. The $50,000 tournament ended up being my second tournament ever, and I finished 37th out of 144,” said Greenwell. Tom Kennedy #87 went on to win the $50,000 Disc Golf Tournament. 34 years later in 2013, Tom auctioned off several historic items from the event for charity. 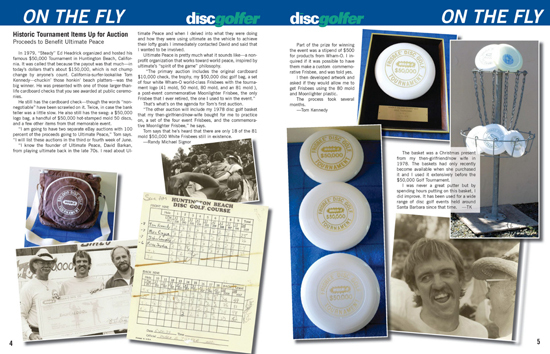 You can read more about the auction in the digital version of DiscGolfer Magazine’s Summer 2013 edition. Click on the image above to view the fully interactive digital version of this article in DiscGolfer Magazine. Ed was a control freak. He liked being the man in control of the PDGA and resented attempts by players to control the direction of the organization. It’s important to remember that, until 1982, he was doing essentially everything by himself. Considering how active he was—running a start-up company, traveling the country promoting a new sport, selling discs and baskets, installing courses—it’s amazing he had any time at all to process memberships, write newsletters, and keep the PDGA going. By 1980, a growing number of players began to challenge Ed’s control of the PDGA. In 1981, a group of players started a new organization to be run by the players and invited Ed to be #001 of the new club. Ed declined the invitation, lashed out at the organizers in a flaming letter, and used his clout to extinguish the fledgling organization before it had time to grow. This particular incident alienated many people and his popularity suffered. The next year, Ed decided to hold the first Disc Golf World Championships in Los Angeles. It was there before the event started at a meeting of his regional reps that Ed decreed players could throw only Wham-O discs (the brand he was selling at the time). This was another unpopular decision, as players had been lobbying Ed to allow other discs such as Jan Sobel’s popular Super Puppy but he stood firm on his decision. It was here at this raucous meeting that the first seeds of the present day PDGA were sown. Ed asked if anyone wanted to put together a pro tour for the next year. Future Disc Golf Hall of Fame (DGHOF) member Ted Smethers #1159, then a little known pro from Little Rock, Arkansas, volunteered. Ted, using a map of the USA with push pins where courses existed, assembled a database of courses and matched up course pros with many of the courses. He then called each pro—this was before email existed—to schedule tournaments and by winter he had a PDGA pro tour scheduled for 1983. This tour would serve as a qualifier for the second Disc Golf World Championships to be held in Huntsville, Alabama. Coincidentally, 1983 was also the year a new disc company called Champion Discs (now known as Innova) debuted with its new proto Aero, then called the Eagle. The Eagle, designed by another future DGHOF member Dave Dunipace #987, represented a quantum leap in technology and instantly became the hot new driver that everyone was throwing. Later that year in Hunstville, before the tournament started, Tournament Directors Tom Monroe #33 and Lavone Wolfe #580 didn’t ask Ed—they told Ed—that any legal-weight disc, including Eagles and Puppies, could be thrown. This was the first time the players prevailed in a contest of wills with Ed. It was this Huntsville controversy more than anything else that persuaded Ed to decide to slowly relinquish control of the PDGA to the players. It was at the next Disc Golf World Championships in 1984 at Rochester, New York (site of the seminal AFDO a decade earlier) that Ed handed over control of the PDGA to a group of players led by Ted Smethers #1159. At the players meeting, Ed ceremoniously handed Ted a glistening green bottle of Genesee Cream Ale as if bestowing the keys to his disc golf kingdom. This was a key moment in PDGA and disc golf history alike; the players would now begin to assume the leadership roles in the organization. Ted, and other players who wanted to help, spent two years working on various projects including several drafts of a constitution. During this time Ted, Ed and the team butted heads but they made progress. According to Rick Rothstein’s Disc Golf World News (the source of accurate informative disc golf news for decades), the players approved a steering committee of Ted Smethers, Ed Headrick, Lavone Wolfe #580, Patti Kunkle #283, and Roy Culbertson #1814 at the 1985 Disc Golf World Championships in Tulsa, Oklahoma. The first formal all-member election for the first PDGA board of directors was held in late 1986. The first board—Ted Smethers, Rick Rothstein, Tom Monroe, Steve Wisecup #1467, Darrell Lynn #784, and Joe Feidt—began to chart a course through fits and starts that would gradually allow the PDGA to grow into the juggernaut it is today. The PDGA has seen dozens of Commissioners and Executive Directors come and go over the years. From “Steady” Ed to DGHOF members like Elaine King #3090 and John Houck #1688. One of those was DGHOF member, Jim Challas #160, serving as Commissioner in the late 90s. In 1998, Jim forwarded some information that he received from the Statistics Committee over to yet another future DGHOF member, Chuck Kennedy #4949. As an avid ball golfer, Jim believed that the PDGA needed some sort of handicapping system similar to the one he had become so familiar with. In many regions of the country, clubs were already taking on this issue on their own. Several larger clubs had come up with their own version of what is now referred to as a “bump rule”, forcing players that won in certain divisions or won a certain amount of events in a series in a specific division to be “bumped” to the next highest division. At the time, the now current PDGA International Director, Brian Hoeniger #4022, was serving under Challas as the PDGA Administrator. Chuck flew to Toronto to talk with him about the Player Ratings concept, and Hoeniger was on board. Hoeniger paired Chuck with one of the members of the Statistics Committee, computer buff Roger Smith #9581. 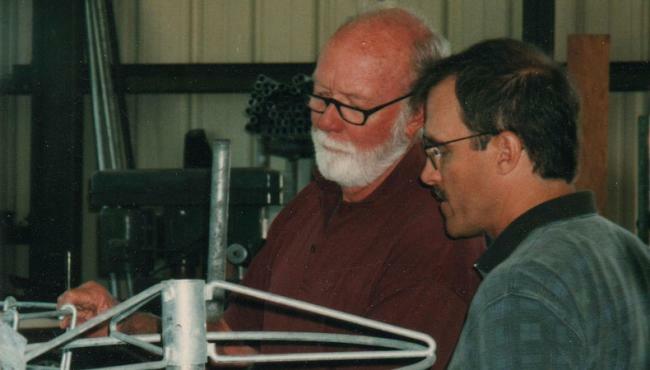 Chuck Kennedy #4949 (right) and “Steady” Ed #001 (left) in 1997 at Ed's workshop in Watsonville, CA. Smith developed the code to produce Chuck’s ratings system against tournament statistics, with the 1998 PDGA Disc Golf World Championships being the guinea pig. Eight rounds were played on four courses during the ‘98 Worlds, the reason that to this day Player Ratings Propagators have to have at least eight rated rounds. A push in 2002 by then Commissioner Pat Govang #13902 to have the ratings implemented across all divisions in all events was made, and eventually accepted. Theo Pozzy #14166 agreed to help get Chuck and Roger’s Player Ratings system implemented into the PDGA database. 2003 would become the first year that Player Ratings were used to define which divisions amateurs could compete in, and the Player Ratings system has been in place ever since. Chuck and Roger are still heading up the system today, constantly working to ensure the Player Ratings are as fair and as accurate as possible. A daunting task really, with the amount of members we have compared to then, not to mention the number of new courses and new events. “When people would ask where the PDGA was located, I always told them it’s in half of a room in a house on an island in Canada,” said current PDGA Executive Director Brian Graham #5861 with a chuckle. It might sound like a joke, but Graham wasn’t kidding when he responded that way. For decades, the PDGA “headquarters” was simply the home of whoever was running the organization. Graham would have been referring to then PDGA Executive Director Brian Hoeniger’s home in Toronto, where the PDGA was “headquartered” for many years. Hoeniger has perhaps the longest tenure with the PDGA as a staff member, with his first day as Administrator being January 1st of 1997. At the time, Administrator was the one and only paid PDGA position, and Brian happily accepted the position. Hoeniger took over for Becky Powell, who was serving as the Administrator in Weatherford, Texas. Powell took over in 1995 with the tough task of essentially rebuilding a broken PDGA, but she pulled it off gracefully. In 2002, as more staff positions were added, Hoeniger was promoted to Executive Director. With the sport getting bigger and bigger at the turn of the millennium, Hoeniger and the Board of Directors agreed that the PDGA should return to the USA. But…to where? Cut to 2002, Brian Graham is working with the Greater Augusta Sports Council and Columbia County Parks on a series of land development projects. The Director of Columbia County Parks, knowing of Graham’s interest in disc golf, presents Graham with a 90-acre piece of land in Wildwood Park to see if he thinks it has good course potential. It definitely did. But Graham knew it could be so much more. Why have one course when there is room for three? What if there was a clubhouse, and a pro shop? Or a disc golf museum? A hall of fame? A new home for the PDGA, which was already in need of relocation? The gears started turning and everything started falling into place. The county and the parks department approved. Graham then presented the proposal to the PDGA Board of Directors at the 2003 summit and they approved. Discraft and Innova were on board. DGA was on board. The Disc Golf Hall of Fame was on board. Everyone was in, and construction began. Graham later realized that everything he was describing and working towards at the time came from an article he read in Disc Golf World News, written by none other than Dan “Stork” Roddick, in which Stork detailed a mythical disc golf mecca with all the amenities of a high-end golf clubhouse plus championship courses. It was a “wouldn’t it be great if” type of piece, and with a bit of luck and a ton of helpful partners, Graham was making it happen. Hoeniger and his wife Lorrie moved down to Augusta for the next two years while the facility was being built, renting out their house to a friend in Toronto. To get started, they both lived in and ran the PDGA from a park ranger facility that was offered by the parks department while PDGA's permanent headquarters was being built. They eventually rented a home near the entrance of the park and used the ranger station as a dedicated office. Things were starting to get real! As head of the committee for the project, which he was referring to at the time as the National Disc Golf Center, Graham continued working closely with Hoeniger and the Columbia Country Parks & Recreation department on the development of the property. After running the 2006 PDGA Professional Disc Golf World Championships in Augusta, GA as co-Tournament Director with another local disc golf celebrity, Pete May #12700, Graham decided to take a year away from disc golf. His plan was soon thwarted when, after 11 years of dedication to the organization, Brian Hoeniger and Lorrie Gibson decided it was time to hang it up and head back to Toronto. With the Executive Director position up for grabs, and practically in his back yard, Graham could not pass up the opportunity and threw his hat into the ring. Brian Graham was awarded the position by the PDGA Board of Directors and his first day as PDGA Executive Director was April 1st, 2007. The International Disc Golf Center officially opened its doors just a few weeks later. The facility now boasts three championship courses, a pro shop, office space for the PDGA staff, the “Steady” Ed Headrick Memorial Museum, the Disc Golf Hall of Fame, picnic pavilions, and more. Less than a decade has passed since the IDGC opened and the sport is growing so fast that there will soon be the need for an additional facility to accomdate the growing staff required to serve the growing membership. As pointed out by PDGA Ratings guru Chuck Kennedy, the number of PDGA members and the rate at which membership is expanding is far different today than it was in the early days. As of 11:00am EDT on July 6th, 2016, the PDGA’s newest member was assigned the number 87248 with nearly 31,000 active members. But let’s take a look at how we’ve come to that number in the last 40 years. The charts below are updated through the end of 2015. Following the same trend as our member numbers, the number of PDGA-sactioned disc golf events has grown immensely over the last few years. 2015 ended with a total of 2,590 events, including seven that were on the PDGA National Tour, 12 PDGA Majors, and 100+ A-Tiers. As with every year, we are on pace to easily surpass that number, with 3,000+ events already sanctioned for 2016. Decades later, one can only wonder, would the Father of Disc Golf be happy with where the sport is today? Few people would be able to speculate better than Stork, so we asked him. Since 2015 it seems that our great sport has received more mainstream media attention than in the past 20 years combined with close to a dozen features on ESPN's Top 10 Plays on Sportscenter. We've also had disc golf videos go viral like the incredible albatross thrown by Philo Brathwaite #26416 which has now been seen by tens of millions of people around the globe, covered not just by sports media but by the news media as well. It was even turned into a meme by SBNation and parodied by Tosh.0 on Comedy Central. Where will the PDGA be decades from now? At the current rate, it's impossible to say. What we can say is that disc golf is growing at a rate that is breathtaking. All we can do is continue the push to introduce this amazing sport to more and more people. And we will. We ALWAYS will. "Steady" Ed talks about how far the sport had come at the 1993 PDGA Professional World Championships.